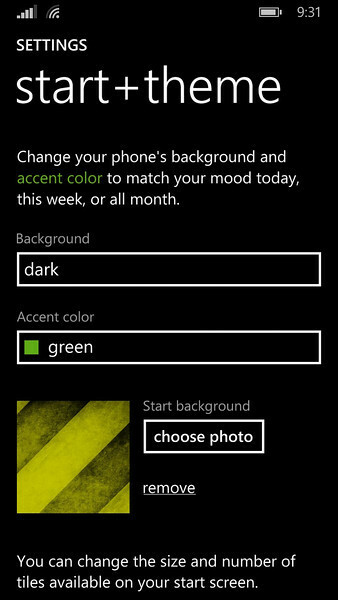 A great way to personalize your Windows Phone 8.1 device is a custom start background. You are no longer limited to using the 20 or so accent colors as the default tile color. You can now select an image file to use as the background. When you select an image, it becomes a fixed background. When you scroll the start page, the location of the image stays fixed, Most of the bundled apps will use a transparent background when a background image has been select, allowing the background image to show through. This allows you to personalize your phone even more to your tastes. You can use any image that is on your phone or accessible through OneDrive. I have found that using darker, muted colors worked well, providing a good contrast with the foreground tile color. When you click choose photo, you get the standard image picker and you can select an image that is on your phone or in your OneDrive account. The image that I used here is from the DeviantART web site. I did a search on “grunge” and selected a couple of images that I liked. This image is named Hazard Grunge and is from the user named WheelOfFish. After selecting the picture, you will then select which area of the picture to use as the background. Since the image will mostly likely not match the aspect ratio of your phone, you select which part to use. With the final result, you get a much cooler looking start page. And it looks more like your phone than just another Windows Phone. After launching an Azure project in Visual Studio 2013, I was handed a “The ‘CctSharedPackage’ package did not load correctly.” error message. I was unfamiliar with that one, and a quick check of the forums showed that a few people had reported this happening after installing the latest Windows 8.1 update. An update that I had installed two nights ago. Something in the Windows 8.1 April Update blew out at least one assembly that Visual Studio needed. This has an easy work around. Shut down any instances of Visual Studio that you may have running. Go to “Programs and Features” in the “Control Panel” and look for an item that starts with “Windows Azure Tools for Visual Studio 2013”. Double-click that item to bring up the modify setup dialog. On that dialog select “Repair”. That will churn for a minute or two. After that completes, you should be back in business. If you are using the Azure Tools with other versions of Visual Studio, you may may to repair them as well. An alternative means of fixing this is by re-installing the missing assembly into the GAC as described on Stefan Camilleri’s blog. I chose the self repair option of the Azure Tools installer, because I had no idea if anything else was broken. That’s the why Windows Installer technology has the repair option. It will fix the stuff under the hood that you can’t easily see. Once I got that straightened out, I checked to see if there was a later version. I was at v2.2 and v2.3 was released during //Build. So I grabbed that and installed. I probably could have just upgraded straight from 2.2 to 2.3 without repairing the v2.3, but I did this way with out any problems. If you or anyone you care about has been dealing excessive battery drain on the iPhone, a former Apple Genius Bar staffer has written the single best resource. Scotty Loveless posted The Ultimate Guide to Solving iOS Battery Drain on his blog. Bookmark it, print it, Instapaper it, just keep a copy of it somewhere. His article was aimed towards iPhone users, a few of the tips are applicable to all smart phones.